The color of a chickens’ comb can give you some information about their health. A mature laying hen will usually have a bright red comb. This can also be an indicator, along with squatting and checking out the nest boxes, that she is getting ready to lay. Large combed birds tend to originate from warm climates, the comb helps to cool them down. Blood is cooled by the air before traveling through the rest of the body. Birds that are in a molt or have not started to lay eggs, will often have pale pink combs. Although this can also happen when they are anemic, or infected with parasites such as lice mites or worms. The Self Blue Wyandotte Hen pictured on the right was laying at the time this picture was taken, the Marans pullet below has not yet started to lay. Both of these girls are perfectly healthy but you can see a difference in their comb color. Bright red combs also indicate a nice supply of blood to the head and good circulation. Blue or purple combs and wattles can mean your chicken is having challenges with his or her circulation. This can be caused by illness or extremes in temperature. If the comb gets frostbitten it may show black spots, especially at the tips. Sometimes this reverses itself after the bird warms up, but at times the damage is permanent and the tissue can even fall off. An old trick is to use vaseline on the comb and wattles, especially with large combed hens or roosters. I like to use coconut oil, which has a melting point of 76 degrees and therefore will stay put in the winter. And you won’t be using icky petroleum products on your flock. 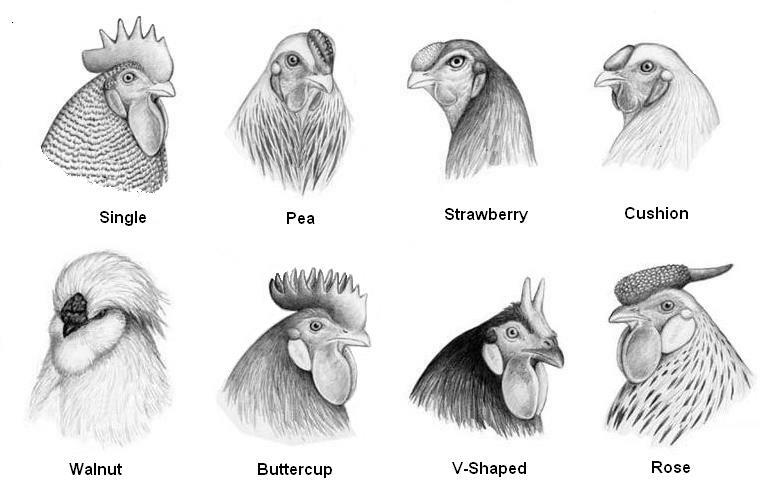 There are several types of combs on chickens, some of the more common are the single, pea, rose, buttercup, cushion, v-shaped, strawberry and walnut. Wyandotte Rooster experiencing stress after several days of frigid temps.